Italy sent hundreds of migrants towards Spain in a small naval convoy on Tuesday after shutting its own ports to them, sparking a war of words with France that exposed EU tensions over immigration. The convoy set sail at around 9 pm (1900 GMT), according to a spokeswoman for the Franco-German charity SOS Mediterranne which is operating the Aquarius. It will take the Aquarius about 10 days to make the trip to Spain and back, leaving the Dutch-flagged Sea Watch 3 alone off the coast of Libya—a staging ground for people smugglers—looking out for migrant boats in distress. 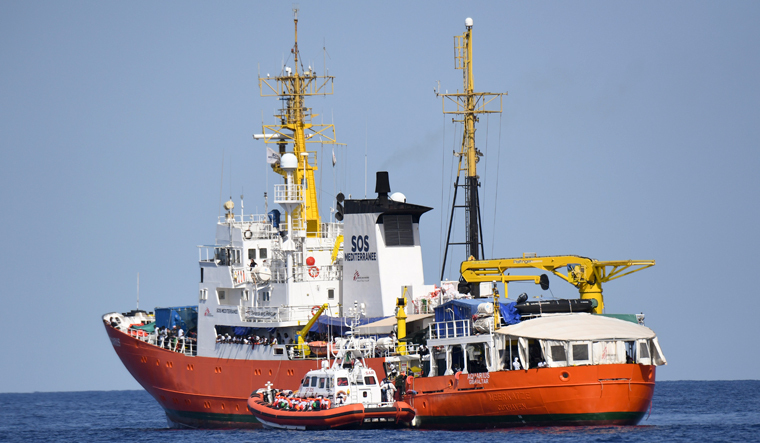 The Sea Watch reported that a migrant shipwreck had claimed at least 12 lives. A US Navy ship, Trenton, radioed Sea Watch on Tuesday to say it had picked up 12 bodies and 41 survivors from a sinking rubber boat. “There is a degree of cynicism and irresponsibility in the Italian government’s behaviour with regard to this dramatic humanitarian situation,” government spokesman Benjamin Griveaux quoted Macron as telling his cabinet.